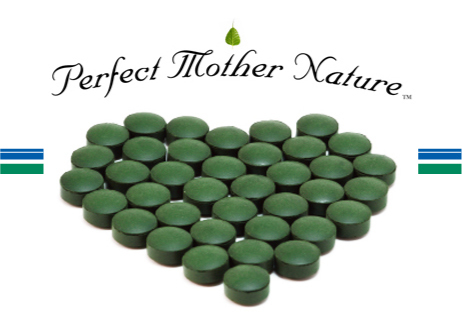 Perfect Mother Nature Broken Cell-Wall Chlorella Tablets are USDA Certified Organic, GMO-Free, Vegan Friendly, and are cultivated and manufactured in a Certified GMP (Clean) Facility in Taiwan. This ensures a higher grade, unadulterated, and absolutely clean end-product that is 100% Chlorella, and has none of the additives or fillers that have become more commonplace with other manufacturers in recent years. Chlorella is a nutritionally dense green algae that is rich in protein, antioxidants vitamins, essential fatty acids, nucleic acids, phytonutrients, and minerals. Like spirulina it contains such a wide and impressive array of foundational nutrients and trace nutrients that it too is considered to be one of the Dietary Superfoods. Chlorella contains antioxidant vitamins such as Vitamins C, D, E, and Vitamin K. It also contains the brain vitalizing B-Complex Vitamins as well as Niacin, Folic Acid, Biotin, Choline, and Pantothenic Acid, which itself is oftentimes utilized for the symptoms of muscle cramping. 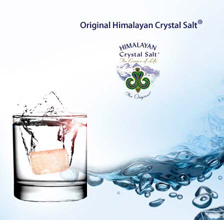 It's mineral profile consists of Calcium, Magnesium, Phosphorus, and Iron. Additionally the Essential Fatty Acids Omega-3, Omega-6, and Oleic Acid; all of which are necessary for proper health are all present and naturally occuring within Chlorella. With a high dietary fiber content, Chlorella also promotes healthy digestion, making it a great choice for weight maintenance. 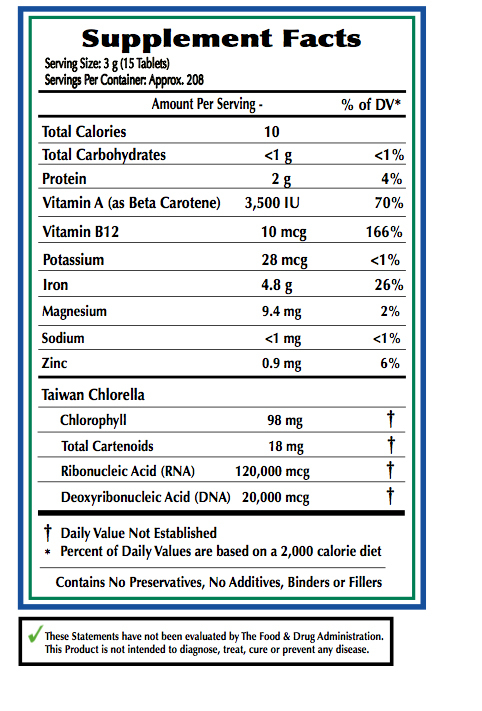 Why is Perfect Mother Nature Chlorella Sourced From Taiwan? Like Spirulina, a large percentage of the Chlorella Products sold in the United States are cultivated and manufactured from Hawaiian Sources. The process that is employed in cultivating these Chlorella Products is the same as Spirulina, and will utilize up to 15% deep ocean sea water and is added to the growing tanks, whereas the space remaining is filled with fresh water. From this point the Chlorella Algae will grow within these tanks until maturity then harvested. In light of the 2011 Fukushima Nuclear Disaster, the general public's concerns were raised considerably with regard to the possibility of trace amounts of radiation being found in food products. To date, those concerns have been widely addressed already, and the various government and media sources have deemed many food products from Japan and other Pacific Regions to be safe for human consumption. Even so, our philosophy at Perfect Mother Nature is that our products should always be sourced from environments that have a clean record for environmental pollution, and more pointedly in this case, also out of the line of any potentially affected areas as it were. 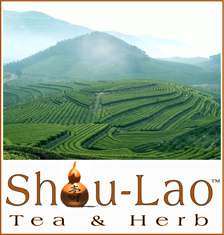 So as a result, we at Perfect Mother Nature have proactively chosen to source our Chlorella from Taiwan, and our Chlorella Tablets are cultivated and manufactured at a Certified GMP (Clean) Facility, and is a GMO-Free, Vegan Friendly, USDA Certified Organic Product. Dioxins are by-products of various industrial processes. They are considered highly toxic and able to cause reproductive and developmental problems, damage the immune system, interfere with hormones and also cause cancer. Dioxins were detected at high concentrations in human breast milk in Japan, raising concerns about disorders in nursing infants caused by breast milk containing various dioxins. So in 2007 Japanese researchers analyzed the dioxin levels in the breast milk and maternal blood samples of 35 pregnant women. 18 of these women were supplemented with Chlorella during their pregnancies, and the effects upon dioxin toxicity in breast milk were investigated. The results showed a significant reduction in dioxin levels as compared to the control group. Additionally the concentrations of "Immunoglobulin A," in the breast milk (important in reducing the risk of infections for nursing infants) was also significantly higher than those of the control group. The findings demonstrate that Mother's supplementing with Chlorella can enhance the purity of their breast milk, and can also boost their baby's immune function. In a 2012 South Korean Study, Researchers observed immunostimulatory effects of short-term Chlorella supplementation. The supplementation of Chlorella was marked by an increase in NK-cell activity that produced INF-γ and IL-12 as well as IL-1β, the Th-1 cell-induced cytokines. 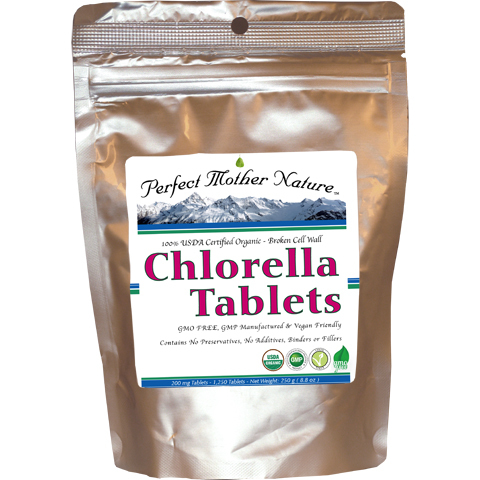 In short, Chlorella exhibits anti-viral and anti-bacterial properties. NK-cells, or Natural Killer Cells are an important focus in immunology and serve an important role in adaptive immune response. Bone marrow production decreases with age, as does the activity of the thymus gland. That being said, NK-cells are known to differentiate and mature within the bone marrow and thymus glands. This fact alone is telling, and illustrates an aspect with which many within the elder population will suffer decreases in immune function, and further implies that Chlorella supplementation may be very helpful to many within this population while under the supervision of attending physicians. Maintenance Dosage: 15 to 25 Tablets with or between meals. 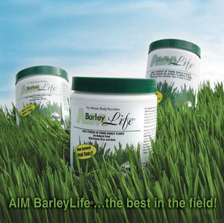 Protein Substitute: 45 to 50 Tablets with or between meals.